God wants to bless and prosper every one of His people. However, I have a problem with ministers teaching that we need to pursue money and try to get rich. The Word teaches prosperity but I do not believe the pursuit of money is what God intended. I may not preach a popular message here but I must preach the Word of God. I don’t care if people will not let me in their churches because of it either. I will not compromise the Message even in the face of a great tidal wave of Charismatics that would disagree. Rev 3:14-19 KJVR And unto the angel of the church of the Laodiceans write; These things saith the Amen, the faithful and true witness, the beginning of the creation of God; (15) I know thy works, that thou art neither cold nor hot: I would thou wert cold or hot. (16) So then because thou art lukewarm, and neither cold nor hot, I will spew thee out of my mouth. (17 ) Because thou sayest, I am rich, and increased with goods, and have need of nothing; and knowest not that thou art wretched, and miserable, and poor, and blind, and naked: (18) I counsel thee to buy of me gold tried in the fire, that thou mayest be rich; and white raiment, that thou mayest be clothed, and that the shame of thy nakedness do not appear; and anoint thine eyes with eye salve, that thou mayest see . (19) As many as I love, I rebuke and chasten: be zealous therefore, and repent. The world’s definition of prosperity is achieving financial success. That is not the God’s definition of prosperity. Yet, the Christian world has fallen for the deception that prosperity means obtaining great financial wealth. Now Christians are trying to become millionaires instead of being content and seeking true spiritual riches. It is these true spiritual riches that the Bible speaks of which we need to seek. 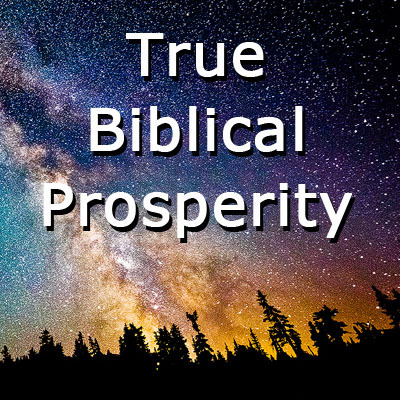 What is the Bible’s and God’s definition of prosperity? It has nothing to do with money, though for some money may be one manifestation of Biblical prosperity but certainly not in every case. Biblical prosperity is simple. Biblical prosperity means being blessed by God. God wants you to prosper but He does not necessarily want you financially rich. If some Christians became financially rich, it would destroy their true riches (spiritual riches) if they were not established in the things of God first. Many teach prosperity to mean “having good success” and “without lack,” which is correct, then they go on to talk about money. But they preface it with a phrase like, but prosperity is not just getting financial wealth. However, all they ever talk about is the financial wealth and how God wants to make you a millionaire. God doesn’t want you to stay in poverty, for sure, but He may not necessarily want you financially wealthy for that could destroy your relationship with Him if you are not a mature Christian. God is not stupid. We all know that financially wealthy people tend to make poor Christians. Why? Because of the great temptation to rely on the money instead of God and the temptation to put money first. Pro 13:7 KJV There is that maketh himself rich, yet hath nothing: there is that maketh himself poor, yet hath great riches. Pro 28:20 (ESV) A faithful man will abound with blessings, but whoever hastens to be rich will not go unpunished. Pro 28:22 (AMP) He who has an evil and covetous eye hastens to be rich and knows not that want will come upon him. Ecc 5:10-14 KJV He that loveth silver shall not be satisfied with silver; nor he that loveth abundance with increase: this is also vanity. When goods increase, they are increased that eat them: and what good is there to the owners thereof, saving the beholding of them with their eyes? The sleep of a laboring man is sweet, whether he eat little or much: but the abundance of the rich will not suffer him to sleep. There is a sore evil which I have seen under the sun, namely , riches kept for the owners thereof to their hurt. But those riches perish by evil travail: and he begetteth a son, and there is nothing in his hand. Ecc 10:6 KJV Folly is set in great dignity, and the rich sit in low place. Does that sound like God is up in Heaven wanting all His people to be millionaires and billionaires? Obviously, no. Pro 10:22 AMP The blessing of the Lord–it makes [ truly ] rich, and He adds no sorrow with it [ neither does toiling increase it ]. (BBE) The blessing of the Lord gives wealth: hard work makes it no greater . (GNB) It is the LORD’s blessing that makes you wealthy. Hard work can make you no richer. (GW) It is the LORD’S blessing that makes a person rich, and hard work adds nothing to it. What is true prosperity, true riches? The blessing of the Lord, not necessarily money. How do we get these riches? Pro 22:4 KJVR By humility and the fear of the LORD are riches, and honor, and life. We get true riches by humility and the fear (reverence) of the LORD. Pro 24:3-4 KJVR Through wisdom is a house built; and by understanding it is established: (4) And by knowledge shall the chambers be filled with all precious and pleasant riches. Through wisdom, understanding, and knowledge shall we increase in precious and pleasant (true) riches. These three verses in Proverbs are talking about the real riches of the Kingdom of God not pitiful measly dollars and gold. We keep lowering God so that He thinks like us. We need to see that what He values is true riches, not what we value. True riches is knowing Him. There it is! It is so simple yet so powerful. Knowing God is real prosperity. Try comparing that to what the so-called prosperity teachers are calling prosperity today. Pro 30:7-9 KJVR Two things have I required of thee; deny me them not before I die: Remove far from me vanity and lies : give me neither poverty nor riches; feed me with food convenient for me: Lest I be full, and deny thee, and say, Who is the LORD? or lest I be poor, and steal, and take the name of my God in vain . Another example of so-called prosperity teachers taking a verse out of context is 2 Cor. 8:9, “For ye know the grace of our Lord Jesus Christ, that, though he was rich, yet for your sakes he became poor, that ye through his poverty might be rich.” Some quote this verse saying Jesus became poor so we could become rich. But then they argue that Jesus was never financially poor because if Jesus was financially poor doing the will of God, how could we believe God would make us rich? So the “poor” here is referring to spiritually, which is correct. But then they say the “rich” referred to in this verse is financially, which is totally out of context. The words poor and rich here have absolutely nothing to do with money. It is talking about Jesus becoming spiritually poor, setting aside His former glory, so that we could become spiritually rich, meaning we now can put on His righteousness. To say that the word poor is spiritual but the word rich is financial is just horrible Bible interpretation. Deu 8:18 KJVR But thou shalt remember the LORD thy God: for it is he that giveth thee power to get wealth, that he may establish his covenant which he swore unto thy fathers, as it is this day. This is another verse that so-called prosperity teacher use to show God wants every Christian financially rich. The word wealth “here, however, is not just talking about money. This Hebrew word wealth is also translated in other parts of the Bible as army, band of men (soldiers), company, (great) forces, goods, host, might, power, riches, strength, strong, substance, and war. This is a great example of Biblical prosperity! God will provide an army, if you need it. God will provide power, if you need it. God will provide riches or wealth, if you need it. God will provide strength, if you need it. But we must ask the important question, who is God speaking to here? God is the speaking to the nation of Israel with whom He was laying out the terms of the covenant. So collectively God gave them the power to get wealth. Does that mean every Jew was rich? No. It simply means collectively they were rich. Collectively, the Body of Christ has the power to become an army, get wealth, power, strength or whatever else we need. However, our wealth is not the wealth of the world. Our wealth is our relationship with God. We are not a literal army with weapons, we are spiritual army. We do not need physical power, we need spiritual power. The things we read about the physical people Israel are types for the realities fulfilled in the spirit by the Church. It is the spiritual riches that takes precedence here, not physical riches. That is not to say physical riches will not or should not be in the Church. No, of course not but we simply need to see that spiritual things are far more important than physical things. We simply need to get our priorities corrected. Because many Christians have the wrong definition of Biblical prosperity, there has been a striving for something which they already have. Christians think if they do not currently have several thousands or millions of dollars in their bank account, then they are not prosperous. So they continue to strive to become rich but in fact they are already prosperous if they would just step back and look at the things God has done for them. God has saved them from sin and made them in right relationship with Him. From this relationship grows many wonderful blessings. Some of the blessings of God do include finances. God’s prosperity brings one out of debt and into a place of integrity so that no bill goes unpaid. You will have all the money you need when you need it. All your needs are supplied and you should have no worries regardless of the amount of money in your bank account. Why? Because if a need arises the supply will suddenly be there right on time every time. That is true prosperity. That is what we should be using our faith for instead of the futile search for wealth that God does not intent for every Christian to have. We also should have an overflow of money to be able to give to every good work that presents itself to us (2 Cor 9:8), not to greedily use it on our own lusts all the time. Luk 9:1-3 AMP THEN JESUS called together the Twelve [ apostles ] and gave them power and authority over all demons, and to cure diseases, (2) And He sent them out to announce and preach the kingdom of God and to bring healing. (3) And He said to them, Do not take anything for your journey–neither walking stick, nor wallet [ for a collection bag ], nor food of any kind, nor money, and do not have two undergarments (tunics). People so often emphasize the great need for money to preach the Gospel. It certainly is necessary to have money to preach the Gospel. However, our emphasis and focus should never be on going after the money. We should only focus on going after God. Where God is will be the money, as well as every other thing we will need to do His will. God wants to bless you. God wants to prosper you. But you must never look at what is in His hand; always look at Him and only Him. 1Ti 6:5-11 AMP And protracted wrangling and wearing discussion and perpetual friction among men who are corrupted in mind and bereft of the truth, who imagine that godliness or righteousness is a source of profit [ a moneymaking business, a means of livelihood ]. From such withdraw . (6) [And it is, indeed, a source of immense profit, for] godliness accompanied with contentment (that contentment which is a sense of inward sufficiency ) is great and abundant gain. (7) For we brought nothing into the world, and obviously we cannot take anything out of the world; (8) But if we have food and clothing, with these we shall be content (satisfied). (9) But those who crave to be rich fall into temptation and a snare and into many foolish (useless, godless) and hurtful desires that plunge men into ruin and destruction and miserable perishing. (10) For the love of money is a root of all evils; it is through this craving that some have been led astray and have wandered from the faith and pierced themselves through with many acute [mental] pangs. (11) But as for you, O man of God, flee from all these things; aim at and pursue righteousness (right standing with God and true goodness), godliness (which is the loving fear of God and being Christlike), faith, love, steadfastness (patience), and gentleness of heart. This passage speaks for itself so I will not try to add to it. However, I do want to focus on one word here: contentment . Now there is a word you will never hear come out of the mouth of these so-called prosperity teachers. It is one of the most wonderful words in our Bible. In it is no striving, no pressing, no worries, no cares. It is just a word of relaxing in the goodness of God. That is what God intended as the normal Christian life. Needs will come. Financial pressure will come. But all those things cannot touch one that is in a right relationship with Him. The problems will just roll off of their back like water off of a duck’s back. A truly prosperous man is not striving to be rich; he only strives to be with the Master and to do His will. In that is true satisfaction and joy and every need will be met. God wants to bless you. He wants to prosper you. But never get that confused with money. God wants you to know Him. That is what this whole salvation thing is about, not obtaining wealth. Knowing Him is true prosperity. Psa 35:27 KJVR Let them shout for joy, and be glad, that favor my righteous cause: yea, let them say continually, Let the LORD be magnified, which hath pleasure in the prosperity of his servant. Is the writer of this Psalm talking about being rich? No. He is saying with God on your side, you are truly prosperous and God takes pleasure in those the know Him and are successful in Him. 1Jo 2:15 KJVR Love not the world, neither the things that are in the world. If any man love the world, the love of the Father is not in him. Mat 13:22 AMP As for what was sown among thorns, this is he who hears the Word, but the cares of the world and the pleasure and delight and deceitfulness of riches choke and suffocate the Word, and it yields no fruit. Do not fall for the trap. Be wise and seek Him and His Kingdom first and all that you need will be taken care of. If a financial need arises, have faith that God will meet the need. You do not necessarily have to believe that lots of money will come in, by the way. There are three other options: 1) the need could go away or 2) the price will be reduced or 3) what you need will simply be given to you for free! Do not think that money is always the answer. The so-called prosperity teachers are selling a get rich scheme, making Christians think that God wants all of them rich. God does not want all Christians rich though for some that is His will. Only a few can handle the physical riches and still stay in a good relationship with Him – only a very few. Would you give your child everything that they wanted knowing that it would cause the child to be spoiled? No. If people have enough sense to know how to raise their children, how much more would God? If God made many Christians rich, it would cause them to lose their salvation. God values the relationship more than the financial success of the Christian in this life. Now, on the other hand, if you could handle the financial riches and still stay in a right relationship toward Him, I do believe God would want you to be prosperous financially as well. God is a good God and He does want to bless us physically, not just spiritually. If we would just seek Him first, our hearts would be made right so that if He did bless us financially, we could handle it. Let us not seek after the wealth but let us seek after Him. When we are ready, He will indeed bless us and we can rejoice in the goodness of God. I believe in prosperity spiritually as well as financially. I do not mean for this article to sound like I am bashing all prosperity teaching. I only want to shine the light of God’s Word on the extreme teachings which are giving us in the Word of Faith camp a bad name. I hope that you will take this Word and see that our focus should be on Him and Him alone. Let us set aside all these other things and put God first.